We are a manufacturer, supplier & dealer of Hot Air Oven Memmert Model: Construction: These Memmert Ovens have a triple walled construction. Inner chamber made of stainless steel. Outer chamber is made of mild steel attractive finished in powder coating for durable operation. Inner chamber is fabricated with ribs to adjust trays to any convenient height. Oven supplied with removable perforated trays 2 or 3 depending on sizes. Trays are made of stainless steel. Our hot air oven systems offer continuous temperature up to 250°C and feature safe operation; allowing operators to worry-free perform their tests. 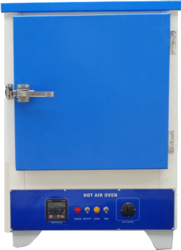 Standard models of our hot air ovens are available from 22 liters to 300 liters volume; however, we can design and manufacture hot air ovens meeting customer provided temperature range, sizes and capacities. There are various optional accessories that our company can add on extra cost in order to make your working more comfortable. 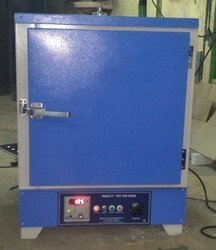 Under economical price, our hot air ovens deliver superior quality drying facilities. Construction: These Memmert Ovens have a triple walled construction. Inner chamber made of stainless steel. The outer chamber is made of mild steel attractive finished in powder coating for durable operation. The inner chamber is fabricated with ribs to adjust trays to any convenient height. Oven supplied with removable perforated trays 2 or 3 depending on sizes. Trays are made of stainless steel. Insulation: It insulated by 3” gap between the walls is filled with special grade wool for proper insulation and to avoid heat losses. It is double walled inner Stainless steel and outer chamber mild steel with powder coated paint fitted with heavy stainless steel hinges with spring loaded lock. Heating elements: Heating elements are made of high-grade Nichrome wire, which is put inside the porcelain beads and placed at the bottom and two vertical sides for uniform temperature all over the space. Temperature Control: The temperature is controlled by a capillary thermostat variable from 5o C above ambient to 250oC with a sensitivity of +/-2 o C.
Ventilation: Air ventilators are provided top at as well as the bottom to ventilate gases and fumes if any. Control Panel: The equipment is provided with a panel which is just below the door having a Capillary type Thermostat, thermostat control known knob, On/Off switch, two pilot lamps and provision for fixing the Timer. Power Requirement: Supplied with cord and plug, Suitable to operate on 220V as per indicator single phase, 50 Hz AC supply.